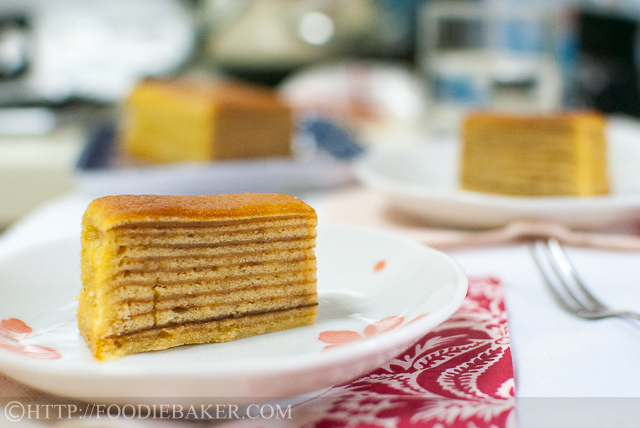 Kueh (Kuih) Lapis / Lapis Legit / Spekkoek is a very popular Dutch-Indonesian layered cake. Lapis Legit literally means “rich layer-cake” – and it is indeed an extremely rich cake, considering the fact that a standard 8 x 8-inch cake can contain up to 30 egg yolks, 500 grams of butter and 400 grams of sugar, and with the addition of a special blend of cinnamon, cloves, mace and anises, this yields a cake that is rich, buttery and eggy texture with a distinct and unique aroma and taste. Almost burnt the second layer! Every year I will bake some Chinese New Year treats to bring back to my hometown in Malaysia. For the past 2 years I’ve been baking Pineapple Tarts, but I was a little lazy to bake them this year, and this Aspiring Baker’s challenge came just in time! Since my attempt on Lapis Legit was successful, I’ve decided to bake it and bring it back for my relatives to try. I eventually settled on Wendy’s recipe (Thank you so much Wendy!) and it worked really well, with the exception of a little hiccup at the start. Wendy’s recipe stated to grill the middle layers for 3 – 5 minutes. So I happily left my second layer in the oven for 3 minutes and when I checked it, it was already burnt! I had to discard it and restart, and I was really close to burning my second layer again (almost, but didn’t), hence you can see a really dark line in the cake. I ended up grilling it for only 1 min 40 seconds (yes, that precise!) and the rest of the layers turned out very nicely. Update 7/2/2014: The 1 min 40 seconds was for a 8×5-inch cake. I baked a new cake this year with a 8×8-inch tin and the grilling time is longer – see the recipe below for the details! I love the buttery and richness of the cake, but it’s so fattening! Here are the step-by-step photos! I’ve included very detailed notes and a video at the end of the recipe, so I will not be talking much in the step-by-step photos. 1) Cream the egg yolks and sugar together. 2) Until the egg yolks are thick and pale into a ribbon stage. 3) Cream butter, condensed milk and rum together. 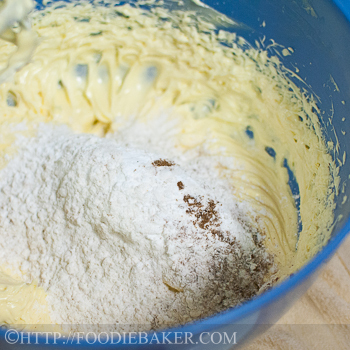 4) Add in flour and mixed spice into the batter. 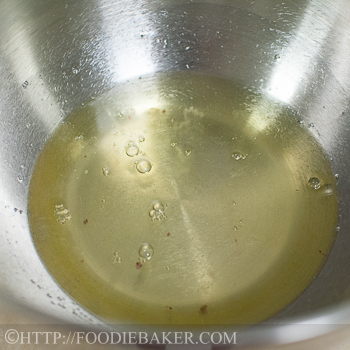 5) Add in the egg yolk mixture and mix until incorporated. 6) Get some egg whites. 7) Beat in salt and sugar. 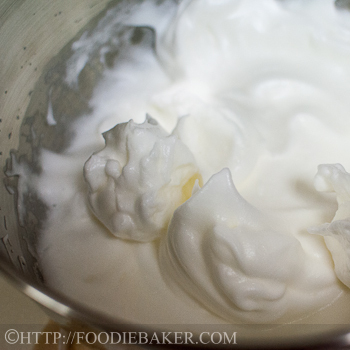 8) Until the egg whites formed stiff peaks. 9) Fold in the egg whites. 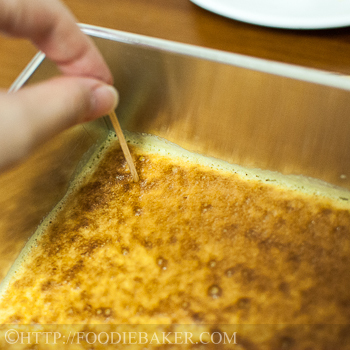 10) Poke the cake layer all over with a toothpick. 11) Press it down to flatten the cake. 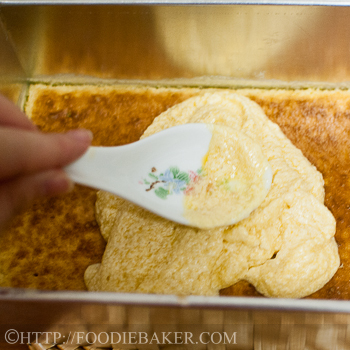 12) Spread the batter all around and bake again! I’m submitting this to Aspiring Bakers #27: Through Thick and Thin – Kue Lapis Classics hosted by Sam of Sweet Samsations. Preparation: Preheat the oven to 200 degrees Celsius. Place a 8-inch square tin (ungreased) into the oven to warm up while you prepare the batter. 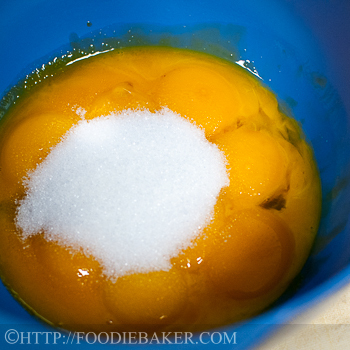 Egg Yolks: Place the egg yolks and sugar in a large bowl. Beat with an electric mixer on high speed until the egg yolks are pale and thick to ribbon stage. Set aside. 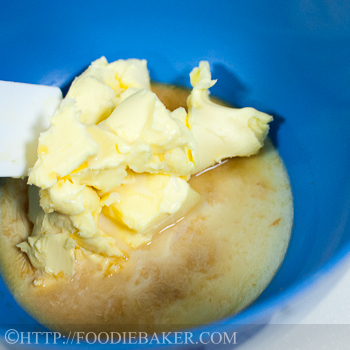 Butter Batter: Place the butter, condensed milk and rum in a large bowl. Without washing the beaters, beat on high speed until the mixture is light and fluffy. Add in corn flour, plain flour and mixed spice and beat on low speed until fully incorporated. Beat in the beaten egg yolks on low speed until fully incorporated. Set aside. Wash and dry the beaters. Egg Whites: Place the egg whites in a large, clean, dry and oil-free bowl. Beat on low speed until foamy. Add in the salt and beat with an electric mixer on medium speed until soft peaks formed. 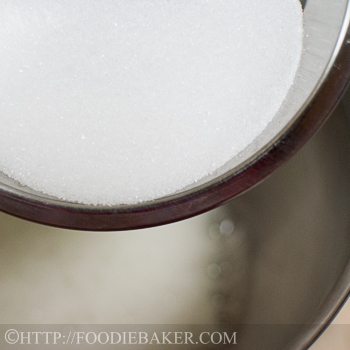 While the mixer is still running, add in the sugar gradually. Once all the sugar has been added, beat on high speed until the egg whites are glossy and stiff peaks formed. 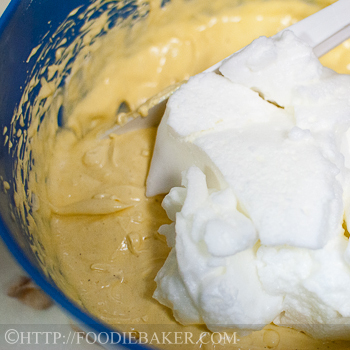 Fold ⅓ of the egg whites into the butter batter. Fold it in to lighten the mixture (don't have to be too gentle at this stage). Fold in the rest of the egg whites gently until fully incorporated. Baking First Layer: Weigh 100 grams of batter. Remove the hot tin from the oven. Brush the bottom generously with the melted butter, trying your best not to get the butter onto the sides, otherwise your first layer may shrink away from the sides of the tin. Pour the batter into the tin and spread it evenly, pushing the batter to the corners of the tin. The batter will "melt" but it's okay. Bang the tin twice and bake the cake for 5 to 7 minutes on the center rack until the top is golden brown in colour. 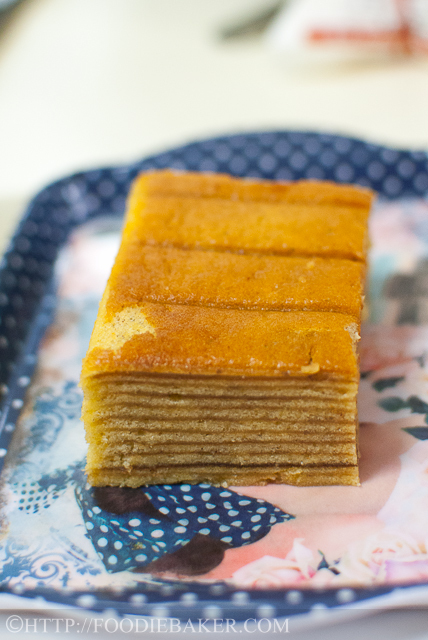 Baking Subsequent Layers: Weigh 100 grams of batter. Remove the tin from the oven. Change the oven onto the grill setting (only the top heating element is on) and increase the temperature to 200 to 240 degrees Celsius. Poke the first cake layer all over with a toothpick. 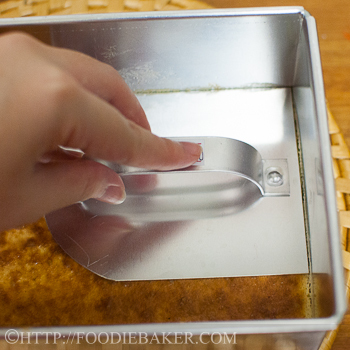 Press the cake layer down lightly with a cake presser to flatten the cake. Pour in the batter and spread it evenly, pushing the batter to the corners of the tin. The batter will "melt" as the bottom layer is warm but it's okay. Bang the tin twice and grill the cake for 1 to 3 minutes until the top is golden brown in colour (I prefer a darker golden brown colour). Repeat the process. 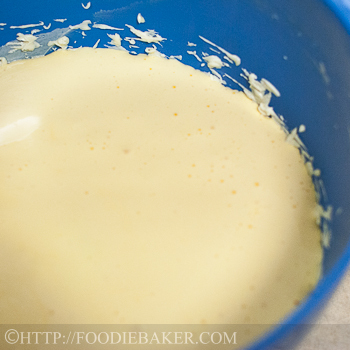 Update 7/2/2014: To be more specific, I made a total of 15 layers with the batter. I grilled the 2nd to 5th layers at 240 degrees Celsius for about 2 minutes 30 seconds (per layer). The 6th to 10th layers are grilled at 220 degrees Celsius also for about 2 minutes 30 seconds (per layer). The 11th to 14th layers are grilled at 200 to 210 degrees Celsius, for about 1 minute 45 seconds to 2 minute 15 seconds. I have a small oven, so the top layers are very close to the heating element, so I had to watch the layers very closely to prevent the layers from burning. Also, it helps to know the "hot spots" in your oven so you know when to rotate your tin to get an even browning for each layer. Baking Last Layer: Follow the same steps as the "Subsequent Layers". Change the oven back to normal settings (top and bottom heating element is on) and reduce the heat to 180 degrees Celsius. Bake for 8 to 10 minutes until the top is golden brown in colour. Remove the cake from the oven and invert it out on a wire rack. If the cake did not fall out on its own after 15 minutes, run a sharp knife around the edges of the cake and invert it out. Cool the cake completely on the wire rack. Storing and Serving: Once the cake has cooled completely, store the cake in a container. Let the cake rest at room temperature for one day for the flavours to develop. Slice the cake and serve. The cake can be kept at room temperature in a container for 1 week or in the refrigerator for up to 3 weeks. Grease only the bottom of the tin. The sides do not have to be greased. The bowl must be dry and oil-free so that the egg whites can rise well. A stainless steel bowl works best, followed by glass bowls. Plastic bowls are not recommended as they tend to retain grease, hindering the rise of the egg whites. Weighing the batter will help to ensure that every layer is even. 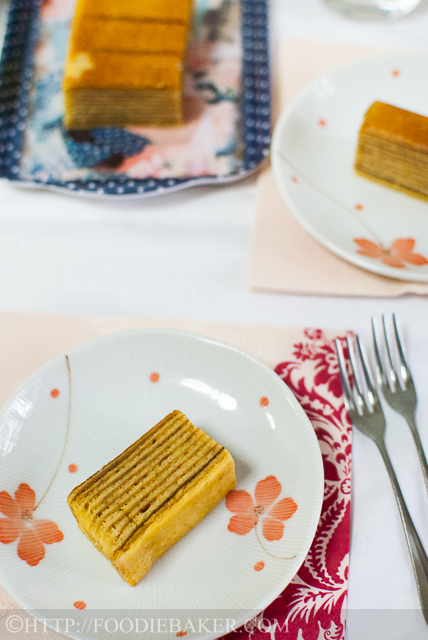 The first and last layers of the cake is baked while the middle layers are grilled. The grill setting means only the top heating element is on. If your oven does not have the setting, place a tray of water at the bottom rack so that the bottom heat will not reach the cake. Poking the cake with a toothpick and banging the tin help prevent the layers from puffing up. When poking the cake, make sure you poke all the way through the cake. If the layer still puffed up after baking, just poke the puffed up area several times with toothpick and press it down with the presser. I have a small oven, so I grilled my cake in the center rack as the top heating element is very near my tin. If you have a large oven, I recommend baking the cake on a higher rack so it’s nearer to the heating element. Watch the cake layers very, very carefully as it will burn easily. As the layers add up, the grilling time will shorten as the the top of the cake is getting closer to the top heating element. Know your oven well – you need to know whether there are any hot spots in your oven. If there are, you might need to rotate them during the grilling process so that they are browned evenly. 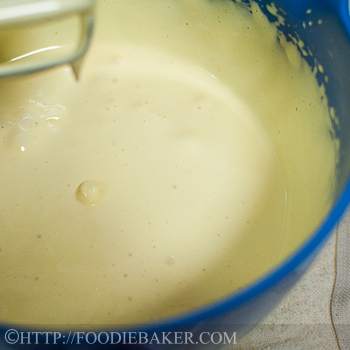 Towards the end, the batter will become watery – I think that is the melted butter, don’t stir it into the remaining batter, scoop out whatever batter remaining and discard the liquid. When I baked mine, I baked only 1/2 the recipe, here, I’m sharing the full recipe. There are several notes and a video at the end of the recipe which may be useful if this is the first time baking the cake. As the original recipe is in weight (grams), I’ve tried to my best of ability to convert it into cups using this here and here. I took about 1 hour to measure the ingredients and mix the batter. The baking took about 1 1/2 hours and the washing up took another 1/2 hour. So do plan your time properly! I love this recipe but my lapis has many bumps in each layer. Please advise how I can prevent these bumps from happening. Can I poke many holes for each layer, what will happen? Hi May, thank you, glad you love this recipe! In order to reduce bumps, after you pour in and smooth out the batter, drop the tin several times on the table counter to get rid of excess and large air bubbles so that the layer rise evenly. If there are bumps after baking, burst them with a toothpick and press down gently to flatten the layer. Hope this helps! Hi Cassandra! Are you using a big oven like AEG or Bosch? Those built-in oven kind? If yes, do place the pan on the highest rack. I placed mine in the center rack because I have a small no-brand oven bought from NTUC (that can only fit a maximum 9×9-inch cake pan). Hope this helps! Pure delicious and fattening bliss 😉 Thanks Bobbi! So many layers of pure bliss. What a great job! Hi Sammie! Yes the grilling time was really precise, 10 seconds less and it’s not brown enough, and 10 seconds more the layer would have been burnt! Thank you for choosing this theme this month, otherwise I wouldn’t have tried this recipe at all! Thank you! Do let me know how your attempt goes! Thank you very much Suzanne! The cake is more popular in Asia, maybe that’s why you haven’t heard of it. It’s really delicious, but really sinful too! Wow, does this look good Jasline! My compliments on hard work and explaining it so well! 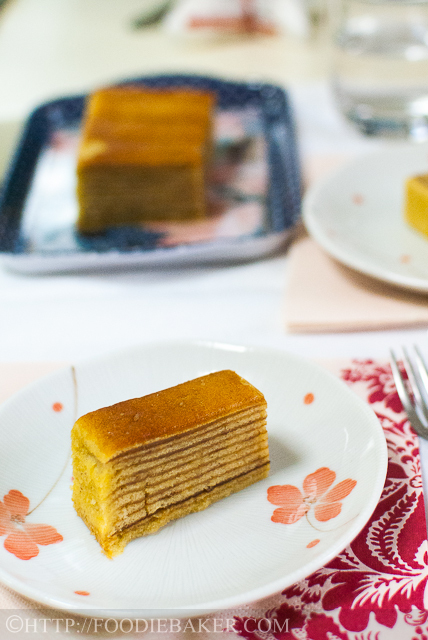 A russian cake that is made with honey and it’s called “medovik” looks almost like this one..
Hi Jasline! Wonderful job on making this lapis! Wow 1 min 40 sec! Very nice! Great tips you got there too!! Your kueh lapis is fantastic! Very evenly layered! Kudos to you! I do not have the patience to grill layer by layer! This is indeed a labour of love! Your family are very lucky! I love all the delicate layers! Hi Jasline, that’s a very delicious cake. Yours look good very nice layering. I love this too but the thought of 3 hours just to make one cake, LOL…I only bake this cake once a year. Sounds amazing! Especially with those spices included. Think you did exceptionally well for a first attempt. Besides, step-by-step photos look great! I agree with the previous poster … it’s a very labour intensive cake with all those layers. Obviously a labour of love and it does look very nice. I am really impressed, amazing really. I have never heard of this type of cake, it certainly is labor intensive and you weren’t kidding about the huge amount of eggs and butter. I just bet it’s really delicious though, Hats off to you for making this cake and yours turned out beautiful!